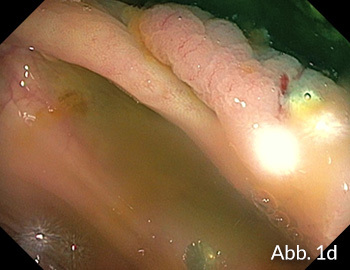 Endoscopy Campus - How can I identify sessile serrated adenomas? How can I identify sessile serrated adenomas? 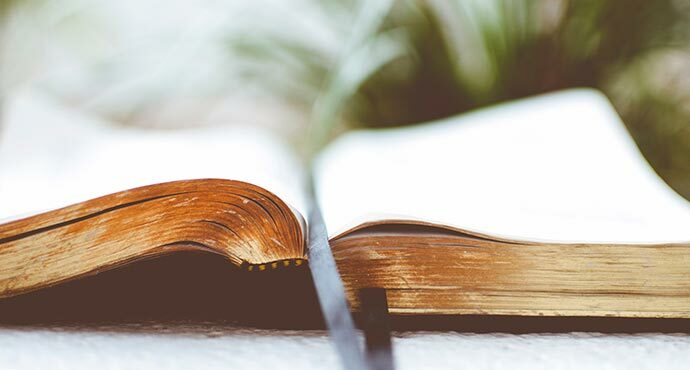 Flat polyps are difficult to identify and may be easily overlooked, particularly in the right colon, where there is sometimes limited bowel cleansing. 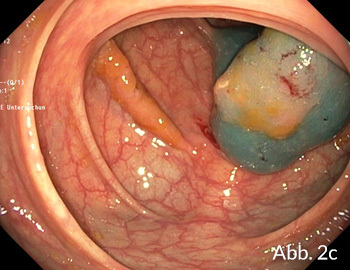 If a small residue of mucous, yellowish soiling is still present even after thorough rinsing, then more attentiveness is needed — a sessile serrated adenoma (SSA) may be concealed underneath it. 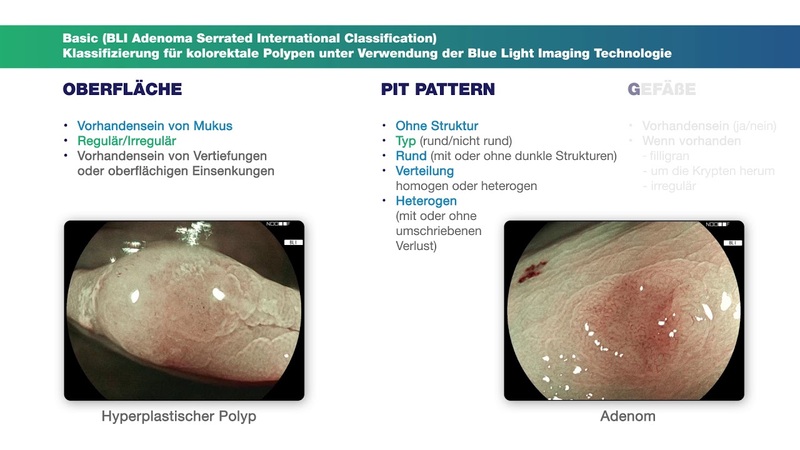 More rinsing, precise examination, advanced imaging (e.g., with NBI, FICE or iScan, depending on the manufacturer) and acetic acid staining may be helpful, as the following images show. It is sometimes also counterproductive to carry out maximum insufflation of the colon, as these very flat lesions then sometimes almost disappear. At the latest after a blue solution is injected under them before a planned resection, however, the borders of the flat lesions emerge very clearly. 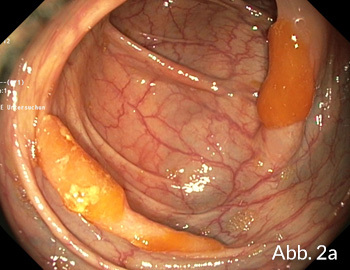 Plus: there are often several of these lesions present, particularly in the right colon! Use the following pictures to train your eyes. For further differentiation, you can then take a look at Prof. Ludwig’s article about the WASP classification. A typical example in a colon that is not fully cleansed. After rinsing, there is still a slight mucous, yellowish residue over a swelling (Fig. 1a). On a closer top view, the polyp becomes clearer (Fig. 1b), and after full suctioning it then appears all the more clearly as a glassy swelling (Fig. 1c). On close-up viewing, the soft SSA components become particularly clear (Fig. 1d), and they are clearly demarcated after injection of saline with blue dye (Fig. 1e). Here again, after rinsing there is still a focal mucous, yellowish residue over two areas of swelling (Fig. 2a). 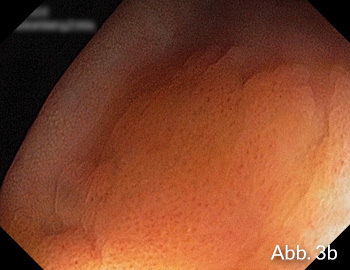 On closer viewing from above, the two polyps become more clearly demarcated (Fig. 2b). 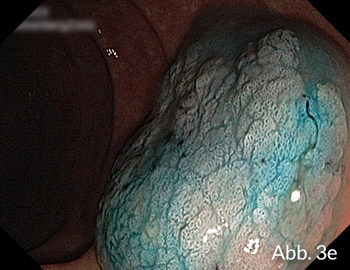 Again, the larger of the two polyps becomes clearly distinct after injection of saline with blue dye (Fig. 2c). 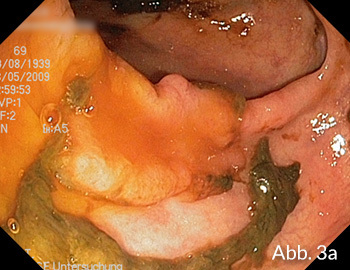 An impressive example in a patient with soiling in the right colon, where a large flat polyp may be suspected (Fig. 3a). At a repeat colonoscopy, this time with better preparation and on an in-patient basis, the polyp — again with a glassy coating — was only located after a long search (Fig. 3b). After further rinsing, however, it is only visible as a subtle irregularity; too much insufflation may have been carried out here (Fig. 3c). It is only after acetic acid staining that the contours appear clearly (Fig. 3d), with confirmation after blue dye injection (Fig. 3e). Some lesions may also be more elevated (Fig. 4a) and when found they are easily seen with rotation (Fig. 4b). 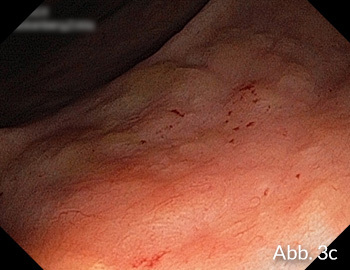 Sometimes the location may be the problem: the polyp in the transverse colon is noted and photographed (Fig. 5a) as the scope is advancing, and the site is marked with two biopsies facing each other (Fig. 5b). Despite this, it proves hard to locate during withdrawal, with success only after 20 minutes’ searching and with a spacer cap — Fig. 5c before resection and Fig. 5d after injection with blue dye.